Amphibians have a soft body and a sensitive skin. 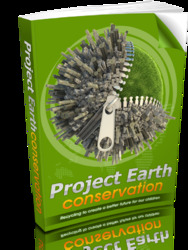 As a result, many frogs, toads, and salamanders rely on chemical protection against predators and microbes. They release noxious compounds, toxins, and antibiotics from granular skin glands (Figure 9). Defensive compounds from amphibians comprise biogenic amines, peptides, proteins, steroids, and alkaloids that are either produced de novo, taken up from the food, for example, ants, or may originate from symbiotic microorganisms. Many toxic amphibians have colorful bodies, for example, the fire salamander (Salamandra salamandra) or dart frogs (Dendrobates pumilio). The colors warn potential enemies that the prey will be unpalatable (aposematism). 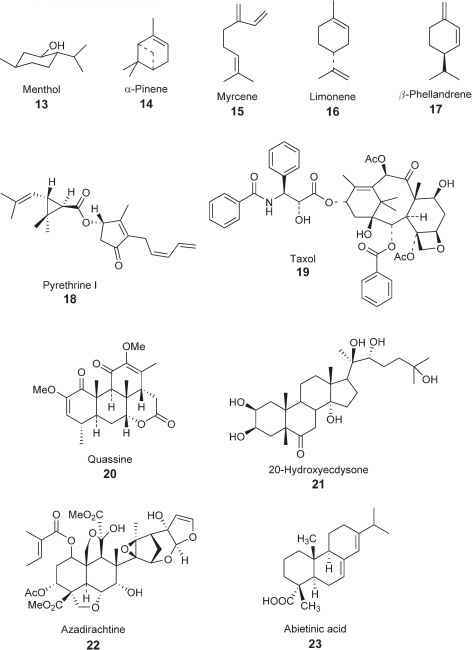 Figure 7 Compounds involved in chemical defense of wasps and bees. as bradykinin, adenoregulin, and dermorphins act as defense compounds against predators, whereas other pep-tides such as magainins from claw frogs (Xenopus laevis) develop activity against microbes and protozoans. Besides peptides, proteins exhibiting hemolytic potential also serve as efficient defense. Interestingly, many amphibians use for their defense steroids which are structurally closely related to plant-derived cardenolides (see Plant Defense Strategies). However, the amphibian steroids such as bufotalin 36 contain a six-membered bisunsaturated lactone ring instead of the furenone ring as in cardenolides from squill (Urginea maritima). Large amounts of the highly toxic steroid-derived batrachotoxin 37 (LD50 2 mgkg-1) are found in Phyllobates terribilis (500 mg per individual). The steroids of amphibians target neuron receptors paralyzing attackers. In most cases, attackers regurgitate amphibians immediately because of their bad taste. 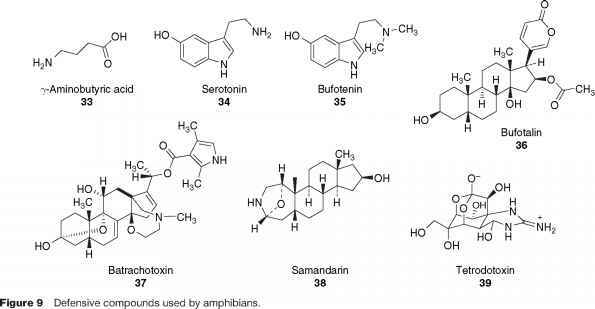 In contrast to the neuroactive steroids, the steroid-derived samandarin 38, a salamander toxin, inhibits respiration and induces hemolysis. Interestingly, Central American toads of the genus Atelopus use tetrodotoxin 39 for their defense, which is a well-known toxin in the marine environment. Tetrodotoxin 39 selectively blocks Na+-ion channels, causing the breakdown of action potentials cutting off nerve and muscle excitation. Apparently, the toxin is neither produced by the marine organisms nor by the toads but originates from symbiotic bacteria (see Marine and Aquatic Defense Strategies). Dendrobates frogs, there is some evidence that the frogs sequester the toxins from their prey.